The Eurovision song contest was targeted by Palestinian protesters who want the BBC to stop televising the event. 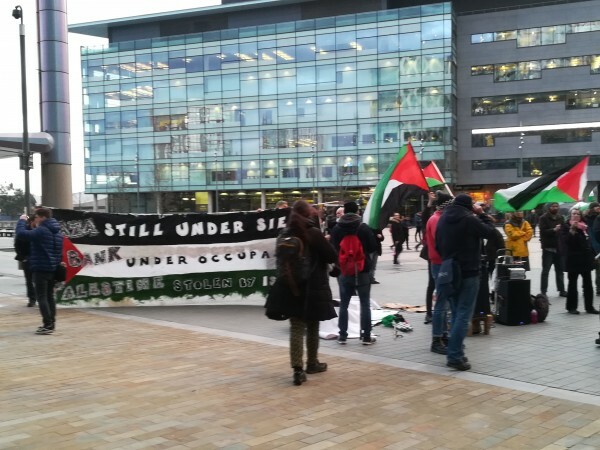 Activists from pro-Palestine gropus, who are angry that Israel hosts the event, gathered outside the BBC building in Media Ciy calling for its boycott. The protest - which also attracted pro-Israel groups - took place during the ‘You Decide Event’ for the Eurovision song contest. The long queue of people waiting to attend the show, where the UK’s Eurovision nomination was chosen, were met by members of several pro-Palestinian groups calling for the boycotting of the contest. Pro-Palestine activists’ claim that Eurovision will be used to ‘artwash’ the crimes of Israel. These groups included Fight Racism Fight Imperialism, Manchester Palestine Action, Manchester Palestine Solidarity Campaign, University of Manchester BDS Campaign, Liverpool Friends of Palestine, and Manchester Jewish Action for Palestine. The protest was titled, ‘Love Eurovision, Hate Apartheid’ where activists called for the contest to be stopped. Israel won 2018 Eurovision with their entry ‘Toy’ performed Netta Barzilai. 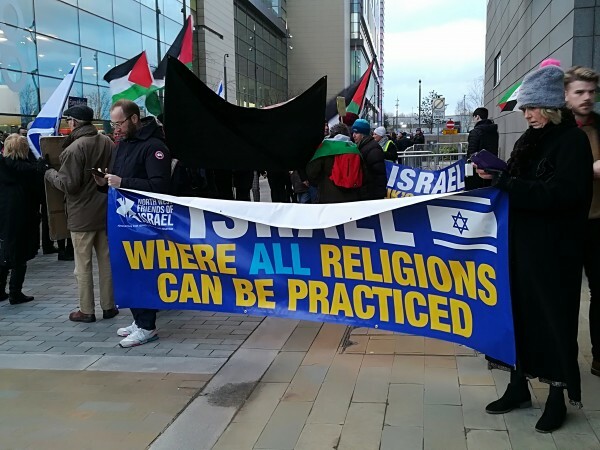 The demonstration remained non-violent despite intense arguments breaking out between activists when Pro-Israel supporters were branded as ‘murderers’ by some members of the opposing group. Activists compared Israel to apartheid Africa and called upon the British government to end support for Israel. No permanent solutions for the conflict were suggested. UK girl band The Tuts recently withdrew from Eurovision in support for the boycott. NQ spoke with Stewart Higgin, the vice chairman for Manchester for Israel. He said: "The people here for the show, they don’t care what they are doing, they don’t care what we are doing. They simply want to enjoy some Eurovision." The Israeli and Palestinian conflict has waged since May 1948, beginning when five Arab states attacked Israel following the failed attempt to negotiate the two-state solution by the UN. Israel won the war and took several pieces of land including the Gaza strip. In 1967, the Arab League summit met in Sudan and issued its infamous three no’s. No peace with Israel, no recognition of Israel and no negotiation with Israel. Since then, pieces of land have been taken and retaken by both sides. Control of the Gaza strip was relinquished by Israel in 2005. Five further attempts for peace were made by Israel but each one was rejected by Palestine. Pro-Israel volunteer, Kim, stated: "Israel is the only functioning democracy in the region. It is not perfect, but it is a democracy where any lifestyle can be expressed." Activist Dan, 21, stated; “I am here to make a stand against the art washing of the crimes of Israel”. “The British government should cut off ties with Israel”.